I like this old photo for what it shows and what it doesn’t. 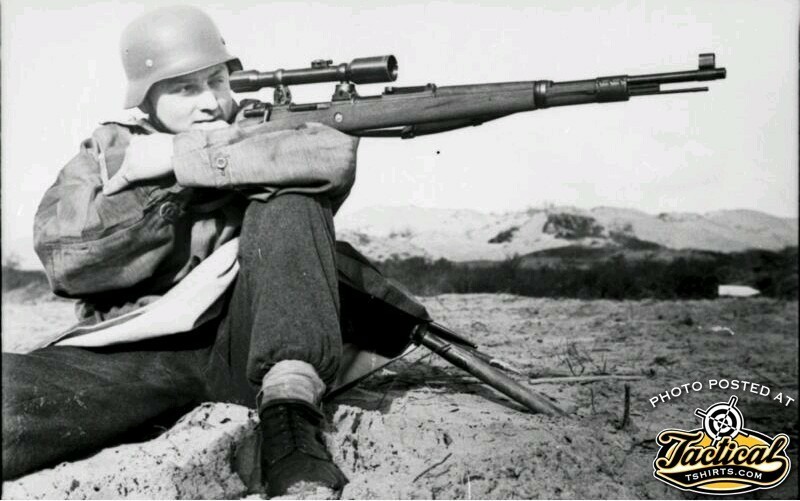 On it’s surface, we see the most famous of rifle ever created, the Mauser bolt action, configured as a sniper. Probably being used by a Axis soldier during WWII. Is there any higher technical level of small arms achievement than a sniper in war? Now for what it doesn’t show: A cheek weld. It shows a chin weld. Sporting a borderline crappy optic featuring an even crappier single post reticle. On mounts that are too high for the objective in question. My point? While sometimes newer isn’t always better, the same can be said for the “good old days”. It’s one thing to be romantic about items and gear being “period correct”. But very quickly, that goal directly conflicts with modern performance and accuracy standards. As a collector, that rifle is cool. But if I was handed that rifle with orders to do the best I could against the enemies of The Republic, immediately I would be grabbing some duct tape and kitchen sponges to build a solid cheek piece.